An aggrieved Nigerian woman has shared a sad story about the deception she faced in the hands of her lover. Chinenye Blezoo took to Facebook to narrate the heartbreak she recently suffered after her boyfriend of 4 years secretly eloped with another woman days to their wedding. I mate my fiancé (now ex) on July 2014, in Lagos when I visited my sister, the visit lasted for 2weeks. Not long that I mate him, he had business issues with his colleague which leads to his arrest. He lost everything he had. After his detention in police station, I contributed for his release to my capability bcs it was my first month at work, I sent the money to his uncle the same way I was paid. Had it been I had more than that of my salary then, I will give because I doesn’t sleep knowing fully well that my love was in sell. He went back to his village after his bail and joined in village hustle but it didn’t favor him, he told me that he wants to go back to Lagos but no transport, that if he can gets to Lagos, he has a friend to squat with while he hustle for living. I gave him his transport and little cash to feed with for some days. I love him because he is a hustler. I vowed to be his bone when he is weak, even without a kobo, I believed for a better tomorrow for us. When he gets to Lagos, he searched for work and during the period of his searching for work, I was sending him feeding money for every 2weeks from the little salary I got. It took him about 6months to get work of which he told me to stop sending money to him when he received his first salary. Sometimes that he visited home, he asked me to complete his transport for him that he will send it back to me when he gets to Lagos and at the end he will not. Husband was coming for my hand in marriage but he refused letting me go, he begged me not to live him for another man. Even when I tested him that I was pregnant for the guy that was seeking for my hand in marriage, he asked that he will marry me with the pregnancy, which nobody will know he was not the one that got me pregnant unless I tell anyone. After everything, he visited my mum and begged her not to allow me marry another man, that he will come for me. My mum agreed bcs I made her believe that I loved my guy and can’t do anything to hurt him. At first, he planned to pay dowry on January 2017, but according to him, they didn’t close work on December 2016 so he was not able to come home. On April 2017, he visited and we had our engagement, from there we kicked off our marriage preparations. On September 2017, he sent 40k to me to start buying things for our marriage, with it I bought some drinks for wedding and some inlaws cloths. I supported him with 40k which I used to buy ashebi’s cloths and my cloths. He called my uncle for dates and 5th January was fixed for traditional marriage, his plans were to monetize traditional marriage in a very low key and boomed wedding, so he also discuss some issues regarding to that with my uncle and they settled. He proceeded and called the vicar for wedding date to be fixed, thou the vicar frowned at fixing date with him on phone, requesting his presence before fixing the date. But he begged the vicar that I will come and represent him bcs he is so much engaged and at far Lagos while am at east and closer, I went and 6th January was fixed for our wedding. The vicar also told me the procedure I will go, the things I ll bring before bans of marriage and the rest of them. I got cert in church, I went to Local Government and made notice entry which they told me to come back after 21days. I did as instructed and they issued me another cert to take back to church, I took it back to church with other church requirements, 3times marriage bans was announce in the church. I asked my hubby for more money so I can starts buying food items, he kept forming too busy and kept telling me next week to next week meanwhile marriage bans had started going on in the church. I kept asking him for money to avoid things not get too cost in the market because of Christmas, most especially rice and groundnut oil. He told me not to worry that he ll take care of those ones and any other thing that I was not able to do when he gets home, whether they get more costly or not. I accepted with joy and zero my mind in them. On late Nov., 2017, I started having these strange feelings within myself, I asked God to show me the meaning. I called my sister and told her the type of feelings am having, she advised me to be calling my God whenever the feelings come. I equally told her to asked my hubby some questions, if he is fully out for the marriage…thou I can’t place the feelings where it maybe coming from. I also asked his closest friend Chibuzor Diala to ask him the same question. After everything, they both told me to relax my mind and move on with my wedding preparations, that my hubby assured them that no cause for any alarm. 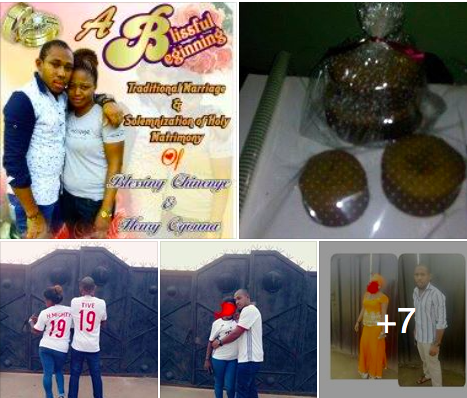 Wow…I got so many favour for my wedding and I was able to raised 90k from family friends and brother, my loved one ordered for my decoration free, and another lover of me dashed me a bag of rice, which I told my hubby about them all. My hubby lives in Lagos while am at east, our marriage was schedule to hold at east so I was at the centre of the marriage plans. I used the 90k I raised to support my hubby in paying for wedding cake, cooking, wedding accessories and part of video/pix coverage which I paid 80% of the monies involved. My lovely mum(God will keep you for me), in order to support her daughter’s marriage, withdrawn all that she had, went to market and bought all the ingredients that will be involve in cooking soup for swallow and ofe akwu. Bans of marriage was announced, he asked that I should designed IV and sent to him via waybill which I did, every notices both Local Govt, towns and villages involve, friends, colleagues in working places, fellow students, we shared our IV. He asked me to take wine and IV to parents of the day and chairman of the occasion which I did. He printed our wedding banner in Lagos. MY BLACK 23RD DECEMBER 2017. On 23rd Dec., 2017, about 5:10am, my hubby called me that he was in the motor going to park to enter bus to east. There was this joy I felt in my heart, that in some hours, I will be with my man. I quickly prayed with him on phone for journey mercies and also asked my mum and father in the Lord to prayed for him. He said that he will call me when he boards a bus. I waited for his call from 5am to 7am, I became worried that my hubby who left to park 5am supposed to have board ticket even the bus suppose to have moved by that 7am. I picked my phone and dialed his numbers, his MTN line was not reachable and his Airtel line was not available. The next thing I heard from network was switched off (deep breath). His lines became switched off from that moment; at first I thought it was a joke. Each minute I became more worried, in total confusion. At about 3:10pm his friend from Lagos called that he was calling my hubby but his lines were switched off. With tears, I told him that it has been the same thing with me since morning. He quickly asked me to calm down that he will arrive by evening. I waited looking at darkness falling without my man beside me. I didn’t control my tears any longer; I wished and asked God that this should be dream which I will later wakeup from. I prayed and cried throughout the night till day; I kept calling his lines each minutes and second but to no avail. Who will rescue me from this…? I quickly called my mum that I’m sinking inside an ocean, she prayed till day…In the morning, I went out to Awka street, with tears I was looking for my hubby, crying bitterly and asking people if any1 saw Henry Uzoma…I became mad without help. His lines were switched off. I sat down on the street and called Chibuzor his friend, I asked him if someone accompanied him to park? The company bus he entered? And if also there was light at the night maybe he did not charged his phones. I also sent his friend Daniel to his compound with the same question. They told me there was light throughout the night till the time he left in the morning. That he did not mention any particular company he was going, that he only said that he will board bus half-way to Benin and from Benin to Onitsha. Nobody accompanied him to park. On 25th Dec 2017, with help of someone I went to my village. The only thing I wished and prayed for was to die. At a point, I don’t kn what to think again, my brain was full with so many thoughts: Could it be accident? If it were accident someone could have called for identification. I keep on searching facebook for any latest accident. Could it be one chance? If it were to be one chance they could have taking everything he had and pushed him away, he has my number off head, and he could have called me by now. If it were the type of one chance that demands for ransom, they would have call to mention their amount. What could it be? My mind took me to rituals… yes!!! Rituals, they had carried my man and slaughter. Tears filled my eyes. What did I do wrong God why?? Why did You allow this to happen to me?? I was bitterly crying and killing myself…I wished to die… people trooping in to console me, my phone kept ringing every second, his friends in Lagos, brothers and relatives calling to kn if I heard any news from their brother. They all believed that I should be the first he will call if he is been release. On 28th Dec 2017, I went to his house in the village and his people became more worried seeing me. I went to his mum and dad’s grave and cried bitterly. I begged the spirit of his mum to please bring his son back home (if only spirit sees and hears). His uncle assured me that all will be well. But there was one particular thing I kept observing, on 26th Dec, 2017; I noticed that my guy’s facebook messenger was showing active 20minutes, could this be true? I asked myself. Even the messages I sent on 23rd was delivered and equally read. I quickly checked his whatsapp, the message I sent was delivered but never read. It made me to send another message which was delivered and read in less than 2days. I became convinced that he was alive but at the same time doubting. Someone from his compound told me that he packed his bags to a girls house instead of coming to east, I said no that he cannot do that. A friend of mine who helped in prayer also told me the same thing as his revelation after the prayers, but I still doubted. 5th January 2018, my traditional marriage day. My clothes and that of my bridal train were down. My wedding cake, decoration materials, trad marriage accessories, my wedding gown and every other thing involved. I picked my phone and laid courses on him via whatsapp, that if he purposely did this to me, it will never be well with him… Lo and behold, Henry Uzoma seeing the courses I laid on him broke his silence and sent a voice message to me via whatsapp. Jesus it was his voice!!! What was he saying…Trash!!! No point, he was beating about the bush… I left my house to a far place the whole day. Naza nwanne m you are a true sister. Amaka my friend u really helped. Chikwendu thanks a million. Eby Umejike thanks a lot. Okey you are a darling. My dear sis Onyi you are the engine of laughter, you alwaz make sure I laugh even being difficult. Dear brother Kingsley, I love you a million times. My able manager Joe and wife I can’t thank you enough. My present oga and wife thanks for your encouragement. Chisom and Dindu I appreciate your love. My 2 big mummies Lady Eby and Mrs Ify I appreciate every bit of your time spent with me, trying so much to see I overcome. Sir Mmaduabuchi, I thank you so much, you really wished to change my heart of bitterness to happiness with your 2hands, thanks for everything. My big Daddy Ven. thanks for being there for me, your calls, words of encouragement and prayers always keep my life ahead. I thanked you all that consoled me. I love you all so much. I equally thanked those that gossiped, those that are still gossiping and those that will kick off their gossips from now, you shall carry on. Am not praying that this should happen to anybody, but in your gossips, remember that you may be a victim of this type of circumstance. On 8th Jan. 2018, I saw a post from his wall saying and I quote; “Some people want me dead on 23rd December 2017, but thank God for saving my life, I will tell the story when I am fit” My man who posted on facebook about the people that want him dead did not call me, when I called, he didn’t pick even when he picked, he didn’t talk. On 10th Jan 2018, I browse my facebook and saw a friend request with the name “Hmighty Uzoma”. I checked the profile but it was a brand new account. But because the account was bearing my guy’s name, I quickly accepted the friend request. In less than 20 minutes, I saw pictures of my man holding a girl very closely, and they were also in uniform. I quickly remembered the cloth, my hubby after sowing the cloth, snapped with it and sent to me to praise the style which I did, so the same cloth was a uniform sowed with this girl. I felt down, I was very bittered and my heart was cutting very fast that I found it difficult to breathe… God showed me mercy through my madam, thou I developed heart problem but am healed now. I had picked the pieces of my heart and as I drop this pen, am moving on. Thank God for everything. It is well with my soul. Like a bird flying in the sky, am now free from every pains. I ll join the month of Match to match forward.